Minister for Women and Equalities Penny Mordaunt has today appointed the first ever National Adviser for LGBT Health in the NHS, and Advisory Panel - fulfilling the Government’s commitment to improving lives as set out in the landmark LGBT Action Plan. “We are proud that our Assistant Director Marcel Varney has been appointed to the Government’s first LGBT advisory panel. We welcome this fantastic opportunity to represent the experiences of LGBT children and young people. Marcel has been a beacon for LGBT colleagues across Barnardo’s as well as leading pioneering services to children, young people and communities. The LGBT Action Plan can be found here. The LGBT Conference will bring together government ministers, civil servants and LGBT sector organisations to discuss the work the government is doing to improve the lives of LGBT people. Attendees will have a chance to learn about, inform and shape thinking on a wide-range of issues covered in the LGBT Action Plan. Dr Michael Brady joined Terrence Higgins Trust as a Trustee in 2004 and became the organisation’s first Medical Director in 2007. Michael is a sexual health and HIV consultant at King’s College Hospital, where he is the clinical lead for sexual health services. Michael has also worked on specific projects in an advisory capacity for BHIVA, BASHH, the RCP, NHS England and the Department of Health. 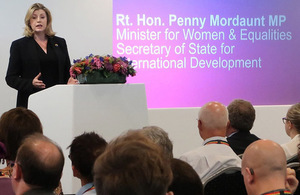 In her role as Secretary of State for International Development, Ms Mordaunt has also announced up to £12 million UK Aid Connect funding will be available for a consortia lead by Hivos to work on LGBT inclusion.